Last Game: Last night at home against St. John’s, the Penguins lost 5-2. Tom Kostopoulous had two assists in the loss. 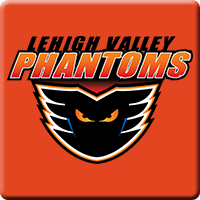 For Lehigh Valley, the Phantoms beat Albany 4-3 in New York and used three third period goals to do so. Last Meeting: January 20 in Allentown, the Phantoms won 5-3. Taylor Leier had a goal and two assists, Colin McDonald had three assists for Lehigh Valley. Teddy Blueger had two assists in the losing effort for the Penguins. Why you should care: Here we go with the Phantoms becoming regular visitors to the Mohegan Sun Arena with the first of six meetings in front of what is going to be a big crowd. The Phantoms will be looking to close within five points of the Penguins for first in the Atlantic and Wilkes-Barre will be looking to shake off the stink of last nights 5-2 frustrating loss to the IceCaps. Other Game to Watch: Hershey hosts St. John’s. Are the Bears a serious playoff threat? Can the IceCaps continue to rack up points and push the North Division leaders?